As the 19th century became the 20th, developers Samuel and Henry Corn were heavily responsible for the transformation of Manhattan’s residential neighborhoods south of 34th Street into vibrant commercial zones. Working together or separately, they bought up groups of once-proud homes and replaced them with modern loft and store buildings. In December 1899 two receptions were held in the parlor of No. 54 West 21st Street to introduce Mary Mortimer to society. Mary’s father, Henry Coit Mortimer, was described by one publication as a “gentleman of the old school.” There would not be many other glittering social functions in the Mortimer house, however. Already Sixth Avenue, just steps away, was lined with massive emporiums that earned the thoroughfare the nickname the Ladies’ Mile. While Mortimer and one or two of his neighbors held out as long as possible, the decline of the once fashionable West 21st Street block had already begun. Corn regularly chose from among three esteemed architects—Alfred Zucker, Robert Maynicke and Louis Korn. For this latest project he turned again to Robert Maynicke. The firm of Maynicke & Franke designed the neo-Renaissance style structure with a sparsely-ornamented limestone base three stories tall. Vast Chicago-style windows--a Midwestern innovation--admitted a flood of sunlight into the second and third floors. The seven-story midsection was clad in beige brick, ornamented by a foliate-carved bandcourse with rigid pendants, stone medallions and diapered brickwork. The topmost two stories were again clad in limestone. Here was the building’s most eye-catching feature—six stocky cartouches in the form of shields carved with American stars and stripes. Herringbone-laid brick, a stylized Greek key, a stone band like a foliate fasces, were among the decorative elements. Six months into construction Lewis, Hurwitz & Co. leased “for a long term of years,” the entire second floor—11,000 square feet. 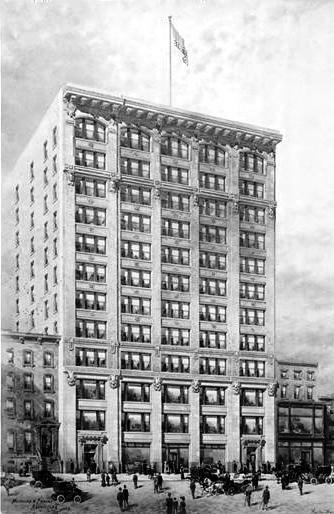 The Real Estate Record and Guide pointed out that on October 23, 1909, that the entire building was now leased. One month after the building opened Henry Corn moved on to other projects. In February 1910 he traded the new structure to the American Real Estate Co. for 33 vacant lots in the Inwood section, far to the north. The deal translated to about a half-million dollars. 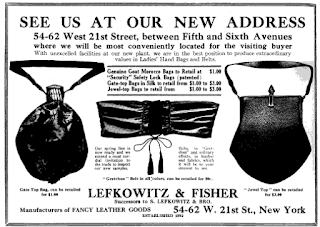 Along with other garment makers here in 1915, such as the Genet Petti Coat Company, the misses’ and children’s dress house of S. Phillips & Co., and the Levison Bros. & Nevins firm, was the newly-arrived handbag firm of Lefkowitz & Fisher. 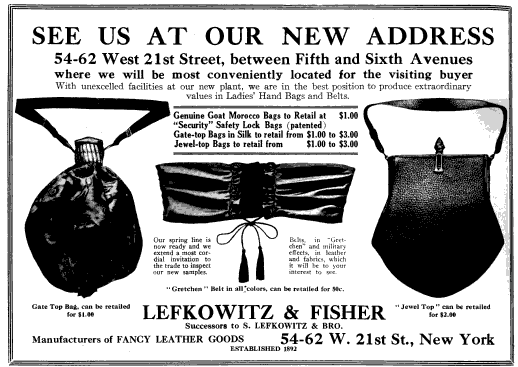 Among the company’s offerings was the leather “Gretchen” money belt which kept a lady’s cash safe from street thieves. Throughout the first decade of its existence the building continued to house mostly garment factories. 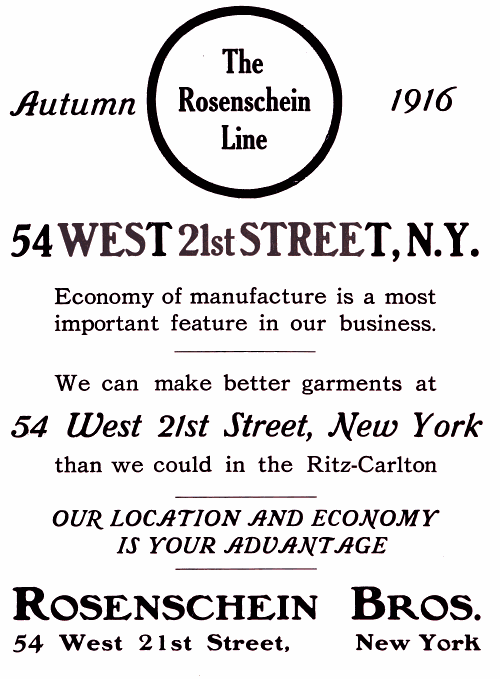 Nevertheless, a few unrelated firms moved in, like the Joseph Roth Manufacturing Company which made stuffed animals and toys here from around 1913 through 1916. In 1917 there was a total of approximately 1,000 workers in the building. Like so many of the tenants, Morris Millard manufactured cloaks and suits here. Among his many employees in 1921 was shipping clerk Joseph Kaplon. His position offered the 22-year old the unusual opportunity to smuggle goods out of the building. Little by little Kaplon pilfered garments which he sold to Jacob Herzog whose Majestic Cloak Company was a few blocks north at No. 333 Seventh Avenue. After a year and a half, on February 3, 1923 Kaplon was caught with two dresses valued at $75 each. In his pocket was a bank book that showed regular deposits of $100 and $200. The amounts—upwards of $2,500 each today—could not be explained by his salary. Joseph Kaplon was charged with grand larceny. During his confession he identified his buyer. Jacob Herzog was reportedly shocked and astounded. “Herzog said Kaplon had left the suits with him to look at and he did not know they were stolen,” reported The New York Times on February 7, 1923. 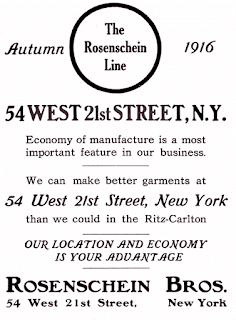 At the time of Kaplon’s arrest the garment district was moving north of 34th Street. While some apparel firms held out—the Elk Knitting Company would stay at least until 1931—a new sort of tenant was moving into the building. The Turbax Corporation was here by 1923. The firm manufactured a wide range of washing machines. That year The Electrical World reported it had “developed a washing machine, ‘Turbax,’ which can be placed in a stationary tub, wash boiler, or bathtub.” Other firms to move in within the decade were the General Slicing Machine Co. and the Adams Grease Gun Corp. The building was the scene of a dangerous shoot-out on February 27, 1925. Policemen responded to a burglar alarm that night. Unable to gain access in the front of the building, they went to the rear and began climbing the fire escape. When Policemen Hyman Kasten and William Quinn reached the third floor landing, they saw three men above them at the fifth and seventh floors. As they pulled their guns, the robbers began firing at them. “More than a score of shots were fired and in the meantime policemen from near-by posts surrounded the building,” reported The New York Times the next morning. While cops guarded the entrances, plain clothes detectives began climbing up a second fire escape in hopes of heading off the thieves. They soon had to duck into a window when they were mistaken for crooks by the cops under fire. On March 17, 1978 an armored truck of the Armored Courier Service pulled up on front of the building making a payroll delivery to one of the companies here. The guards entered the building with the sack of money; but were astonished when they walked out to find that the truck with its $149,000 in cash was gone. The lone driver, Alterber Freedman, had been overpowered at around 9:30 in the morning. Police found the empty truck a block away on 22nd Street between Fifth and Sixth Avenues. About an hour later the driver was released unharmed in Queens. As the Chelsea and Flatiron neighborhoods saw a rebirth in the 1980s, so did No. 54-62 West 21st Street. In September 1988 55-year old Gene Young opened Chelsea Billiards in the former retail space at street level. He told reporters he wanted his 15,000 square foot parlor to “improve the image of the game.” To do so he carpeted the floors and brought in 44 high-end Brunswick tables. In its more than a century of existence, Maynicke & Franke’s handsome loft building escaped major alterations—even the storefronts entered by pool-playing diners appear original. Unfortunately, rushing New Yorkers rarely, if ever, glance up to take in the patriotic stone shields below the cornice.